You know you have read a top class book when it’s over and you feel depressed. I have post trilogy depression, amongst the worst kind of book related disorders. One where you have invested so much of your time and soul into a multi character epic that you tend to forget that in the morning you have a job to go to. Yet at the same time I feel like my eyes have been opened to a new world. Grimdark! Prior to reading Abercrombie’s work I had never experienced such truly gritty and dark fantasy. I now know it is a genre of its own, but to be honest I look at it more as ‘Real Fantasy’. In a similar fashion to the mass market popularity of Game of Thrones, where other fantasy series have failed to grow, the First Law gives us everything we would expect from a well constructed fantasy universe, but also gives us characters that could have come from a history book. They don’t just have faults, they live and breathe by their faults. Reading Joe Abercrombie’s books has shown me how characters can be despicable and make you root for them at the same time. Logan Ninefingers and Glokta are amongst the most interesting and unforgettable fictional characters I have ever come across. Ferro and Jezal made choices throughout the books that felt so real. Often one expects a book to go a certain direction, or a character to say or do a certain thing, especially in fantasy writing. Not for Abercrombie’s characters. As I turned the pages my inner voice was constantly saying no, no, don’t do that, don’t say that. However, this only kept me wanting more. The Last Argument of Kings is a fine climax for the trilogy. I don’t want to spoil anything here, so I will only say that it was good to see things come together in the final battle. Abercrombie takes us into the head of the many POV characters. Using his amazing blend of vivid description and gritty language, we are taken right into the thick of it. I bled with the characters. Swore alongside them. I cringed and laughed with them. Few books draw you in so deeply. I felt I lived the First Law rather than read it. And that is the biggest compliment I can give Mr Abercrombie. I feel there is little need for me to do an in depth review of this book. It is extremely well written. All of the characters that you love are back and in fine form. The story develops in an interesting way and does not repeat itself. There is action, emotion, suspense, drama and just about anything else you need in a good book. Just go out and read it. I don’t often recommend books to my close friends but I will be telling every fantasy fan that I know to pick up these three books and get stuck into them. 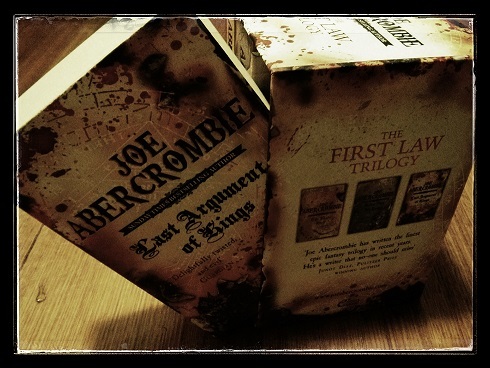 This entry was posted in Reviews and tagged Book reviews, books, Fantasy, First Law, Grimdark, Joe Abercrombie, Reading, Reviews, Writing by blottingaway. Bookmark the permalink.